When demolishing or tearing out rooms before renovating, you will generate a significant amount of debris. In most communities, sending construction materials like lumber, gypsum, metal, and glass with your weekly garbage service is not allowed. An excellent choice for mid- to large-scale home remodel projects is renting a dumpster (or rolloff container). Along with hiring a hauling company, container rental is a practical choice for homeowners. Homeowners can rent rolloff containers the same as contractors do for big projects. Parking the container on the street involves city permits and extra costs. Optimal size for home remodeling is about 20 to 25 yards. Keep the front of the container clear by using traffic cones. Cost for a 20 yd container is about $300 for 5 days plus $130 per ton. Since container companies usually deal with contractors, they may get impatient with a homeowner who does not know the terminology or specifics of renting a rolloff. Names: “Container” and “rolloff” are both acceptable terms for these large metal boxes. In large metropolitan areas, a 20-yard container would be $300 for the rental which includes drop off, pick up, and a 5-day rental. Any additional days would be $15 a day. In addition is a cost of $130 per ton. Your local parking enforcement office or building permit office can give you information about permits needed if you are parking the container on the street. If you have room to place it on your own property, do this so you will have no worries about tickets, fines, or permits. If you live on a street with a neighborhood association, it is almost certain that the provisions of the homeowner’s association contract do not allow for a rolloff without permission. Exemptions may be available by appearing before the association’s board. Whether the container is going on the street or your property, the truck dropping off and picking up the container needs room to maneuver. There is nothing worse than having an irate truck driver call because he cannot back in. More likely, the rolloff simply will not get picked up. At best, you will only be delayed several days. At worst, the container company will charge you for the drive-by, a legitimate charge. Which Size Container to Rent? You will almost certainly need a container one size bigger than you think you need. Carpeting, scrap wood, drywall―all of these waste products take up the volume. Concrete, rock, and dirt are more weight than volume and usually, you can only fill the container quarter full (verify this with your rental company). Containers of similar volume may come in different dimensions. One dimension that you want to ask the rental company about is height. It is hard to heft weighty materials over the side of a high container, so ask if you can get a lower container. Size: Imagine a metal box 12 feet long, 8 feet wide, and 4 feet high. Comments: A ten yarder will not get you very far if you are doing any sizable home remodeling work. At best, you can use it for tearing out a small bathroom. Size: Imagine a box that is 22 feet long, 8 feet wide, 4.5 feet high. Comments: This is about the minimum size container you should ever get. This would accommodate the waste from a small kitchen or full bathroom without cramming and crushing. This fits in front of most houses without too much complaint from neighbors. You can fit carpeting, drywall, and wood in a 30 yarder without too much trouble. 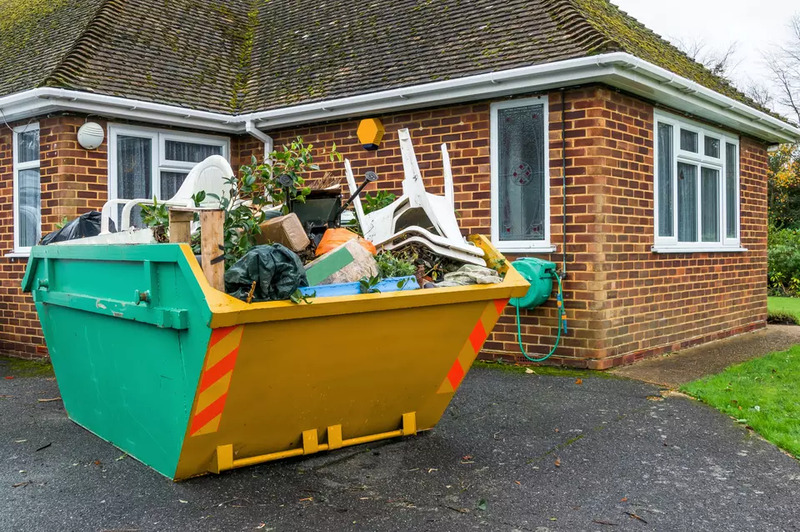 Also, if you are disposing of concrete or rock, you will need a larger container since you cannot fill the container up very high.